Food allergy is on the rise. Due to this, consumers are becoming more aware and discerning with regard to the food they buy and eat. Which is why mobile food vendors should consider food allergy as a top priority not just to eliminate risks for the business but most importantly, to protect the health of customers. According to a study released by the Centers for Disease Control and Prevention (CDC), food allergies among children have increased 50% between 1997 to 2011. In the United States, as many as 15 million people (nearly 9 million adults and around 6 million children) have food allergies. Severe allergic reaction called anaphylaxis can be life-threatening. Each year, an estimated 30,000 emergency room treatment, 2,000 hospitalizations, and 150 deaths resulted due to anaphylaxis in the US. The economic cost of children’s food allergies is around $25 billion per year. These major food allergens (and any ingredients containing protein derived from them) account for over 90 percent of all documented food allergies in the U.S. and represent food items most likely to result in severe or life-threatening reactions. Food truck operators and employees should understand the importance of being allergy aware. Using a system to make sure customers are protected against allergens will not just prevent health risks and legal issues but also help give your business a positive image. Here are some tips to make your food truck allergy aware. Make it a policy to ask customers for any allergies upon ordering. Or put signs that list the ingredients your food truck use to inform people and remind them to disclose if they are allergic to such ingredients. It may be law to post a sign asking customer if they have any food allergies – check with your local health department. Implement a food preparation system that prevents cross-contact contamination. Using different utensils for each ingredient, cleaning tools properly, frequent hand washing or use or gloves, and labeling containers are some ways to eliminate cross-contact of allergens to other products. Never make assumptions about ingredients that are derived from other products. Some processed foods, like chopped nuts or canned products, may contain traces of other ingredients because they were processed in the same production line. Always read package labels of ingredients to make sure they do not contain food allergen derivatives. Modify recipes to offer product variations or let customers have the choice to substitute ingredients. Instead of turning a customer away because of a food allergen, give them a “personalized option” that substitutes the ingredient they can’t eat without sacrificing quality or flavor. Offering choices or ability to substitute not only prevent lost of sale but can also improve your business image. Food allergies should become a priority to mobile food vendors, to safeguard customers and also push business growth. Food trucks and the mobile food industry as a whole will have the highest possibility of success if great tasting products are available and can be enjoyed by everyone. There’s nothing we hate to hear more than something happening to anyone in the mobile food industry. While food truck fires and explosions have occurred before, they are extremely rare. Yesterday the odds where apparently against us as we learned of two major food truck incidents in a single day. The first was at the White House – a food truck caught fire and caused the White House to go under lock down. Reports were that there was a loud bang. President Obama’s plans were temporary disrupted as he was about to leave on a trip. The 2nd explosion not only destroyed the food truck Motley Crews, but also severely damage the owners’ home and several of the neighbors home as well. In this incident there was also a loud bang reported. At the time of writing over 5,000 has already been raise. Please join us in donating, every little bit helps. Related Post: Food Truck Propane Tank Safety. Should Food Trucks use the new social media app Meerkat? Just a few days ago an app launched and has taken the internet by storm. 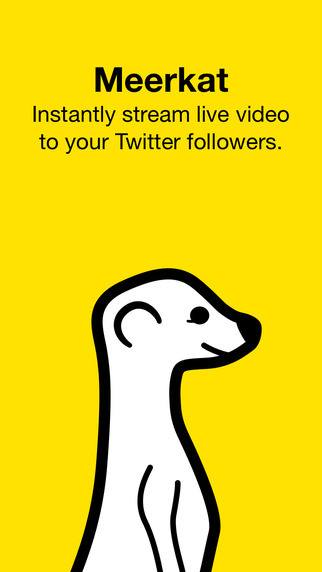 It’s called Meerkat – and it allows you to easily stream video to your twitter followers. Is this an app that the mobile food industry could utilize to engage customers and drive them to their food truck or food cart? Twitter has already been HUGE for food trucks – in fact it’s often included in the definition of the modern food truck. And Meerkat is really just an extension of twitter – you install the app and then you can create a live video stream that gets tweeted out to all of your followers. Your followers can then view the video on the web, or in the meerkat app itself if they have it installed. Many food trucks are already social media pros and use Facebook, Snapchat, Youtube, Vine, Pinterest, and other apps. 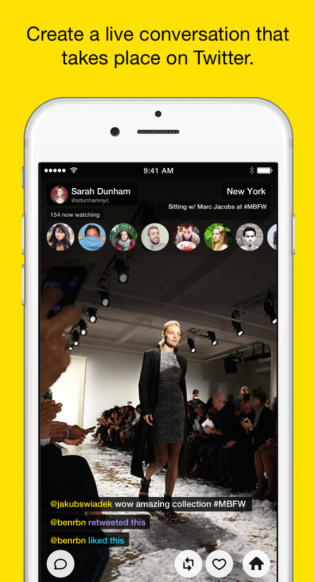 But those allow photos or video….what’s so different and game-changing with Meerkat is that the video is LIVE. Sports fans don’t want to watch the big game after it’s happened – they want to see it live. It’s exciting and if you show your customers that you are near them over a live stream it could really increase excitement. You can show them video of your food and encourage them to come out in a way that’s just more provoking than just tweeting a message or photo. Plus you could set up a stream and leave it on as you prep for your lunch shift – the app is really easy to use. Like any other app, it will take some time for this to catch out – but we really think this could be a useful app for food trucks to help promote themselves and really get customers excited about coming out and visiting your truck. Leave us a comment or tweet us at @FoodonaTruck! We would love to hear from you. Freezing temperatures and icy roads can be very troublesome mobile food vendors during winter. Not only do we have to deal with the snow, ice, and cold temps – but mobile food businesses have the double whammy of lower sales too! But despite these setbacks, you can use the winter season to maximize the other aspects of your business instead of putting your food truck in hibernation. The down time during winter months gives opportunity for owners to do maintenance work on their trucks. It can be easy to put off having symptoms looked at and especially when your current sales are down. But a clicking sound now could turn into a broken CV joint in summer – and it could break and leave your truck not running when you need it the most. During winter is a great time to do maintenance work not just to take advantage of the down time but also as a precaution against the drastic effects of cold weather to food trucks. Even if Mother Nature insists on trapping people indoors, you can still push your food truck business forward by creating new or improving current recipes. Test variations of dishes or incorporate new ingredients give interesting twists that attract more customers or enable you to increase prices. Improve or streamline food preparation process to save time and effort. The winter is also a great time to do experiments and test recipes to lower costs without sacrificing quality and taste. Some food truck scenes have more of a sense of community than others. Even though you can look at restaurants and mobile food vendors purely as competition, having a relationship with them can also benefit your business. Customers tend to try other offerings and it is highly unlikely that they will only eat from one type of food truck. During the lean times of winter, make connections with non-competing businesses (like those offering a different category or cuisine than yours) that can compliment your products. Having a relationship with other entrepreneurs can also give you vital information about great vending spots and suppliers you did not know before. Running a mobile food business year-round can become so demanding that some entrepreneur put all their time in the venture. Though dedication is great and a key to success, even the most hardworking entrepreneurs deserve a time off. Winter can be the best season to spend more time with your family or take a personal vacation. Some people think that taking a break can hurt their business and feel guilty to do it. Having time off should not be seen as a liability but as an investment. Use the down time afforded to you by the winter season to strengthen relationships and most importantly, recharge your mind and body. Studies have shown that respite activities can improve productivity and creativity. Even if you already do this, don’t feel guilty recharging yourself for the next season. Another great thing one can do during winter is deal hunting for equipment and supplies. Finding great suppliers can take a lot of time and effort that entrepreneurs may not have during busy months. Price, reliability, stability, and competency are key indicators in finding business partners for your equipment and supplies. In addition, suppliers can be an important source of information about competitors’ actions, evaluation of new products, and promising trends or opportunities. Strive to create lasting partnerships with great suppliers that can help you cut cost (offering discounts or free shipping), improve your products or services (by suggesting good alternatives), and even spread the word about your business. A great supplier wants you to succeed as it can lead to more business for them. As harsh as the winter has been these past months, food truck owners should not be dissuaded by the cold temps and lower sales volume. Just like the seasons with its highs and lows, running a mobile food business can be cyclical. Just stay positive, proactive, and passionate because, whether in nature or in business, those who can adapt are those who will survive. What tips do you have? We’d love to hear them. Tweet to us or comment below! Growing a food truck business can be very challenging. But having your family involved can lessen the stress of running a demanding venture. Success in the food truck industry do not happen overnight but a family working together offers advantages that can lead to the success of your business. Here are some ways to leverage your family’s relationship to grow your business. Streamline operations. Understanding each other in a personal level can benefit your business processes. Divide and compliment responsibilities according to each member’s strengths to ensure the efficiency and quality of your service. Simplify recipes so that other family members can learn them and help out when needed. Simplify and mix up. A complex menu can overwhelm customers and preparing multiple products can get exhausting. Specialize on limited products and focus on delivering top quality. Develop dishes that do not require too many components or special ingredients to make keeping track of inventory easier. Mixing up the menu can keep people interested and attract new customers. Innovate your service. Book events that you can cater during the truck’s off hours with the help of other family members. Share your route and schedule to customers then offer deliveries while changing locations. Offer special promos to create a following. Develop relationships. Build connections and cooperation with suppliers, local businesses, and other food truck owners. It is best that some family members work to create connections to find reliable suppliers, companies to cater, and take part in the food truck community as a representative of your business. There are many family-run food trucks that work like well-oiled machines, leveraging their close relationship to achieve success. But your efficient business operation can take a hit when one of you becomes unavailable due to an emergency, illness, or needs some time off. Your family may work seamlessly together but it can be hard to find an employee that will work as well. If you really want to grow your food truck business, you will need to have as many processes that are easy to learn as possible. This is one of many reasons why we are building a mobile point of sale application from the ground up that focuses entirely on the mobile food industry. To learn more about how your business can benefit with the Food on a Truck app, join our email list at http://www.foodonatruck.com/stay-updated/. Should I Start a Food Truck with My Spouse? There is a lot to consider when starting a food truck, more so if you want to do it with your spouse. There are advantages in running a business with your spouse but there are also disadvantages that can affect the success of your business and your relationship. Here is a list of pros and cons that you can weigh to see if starting a mobile food business can work for you and your other half. Save money. Working together means you don’t have to spend on hiring another set of hands, at least in the beginning. Because your spouse know that the business revenue will benefit your family, he or she will most likely work for free. Quality time. Unlike couples with separate jobs, you get to spend more time with your beloved working together and this can even strengthen your relationship. Even if you get busy with work, your partner will understand and see what occupies your time because both of you are involved in it. Better communication. Being a couple, you know each other; your mindsets, moods, and motivations. Using this knowledge, you can plan and design a system for your business, saving time and eliminating stress. Emotionally invested. Having your spouse as a business partner means you are working with someone you know is passionate for the food truck. He or she will be the most dedicated co-worker you will ever have. Business problems spill-over. Both of you will not always see eye to eye. You might not agreed on how to achieve the same goal. If disagreements are left unchecked, these business tensions can adversely affect your relationship and food truck business. All your eggs in one basket. Working together in a single business can be risky. If your food truck experience a lean month or if the business does not work out, not having an alternative source of income can become an issue for your family. Starting a food truck with a partner, be it a friend, an investor, or your spouse, has risks and rewards. Plan your business, debate the pros and cons, and see which path will take your food truck dreams to success. What are your thoughts and experiences? We would love hear them! Leave a comment or email us at support@zoomifi.com. Serving high quality and delicious food to customers must always be a top priority for food trucks. But in addition to providing great products, mobile food vendors must also ensure the safety of consumers. Thank you PHMSA (www.phmsa.dot.gov) for providing such a great resource! Contact your propane tank retailer for any concern you have regarding your tanks. When each vendor does their part in providing a safe and exceptional experience to customers, it benefits not just their business but also the food truck community and industry as whole. Lower Oil Prices Benefit Food Trucks. But will they last? Anyone who owns or manages a mobile food business knows how difficult it can be. Competition is tough, food prices change, and consumer preferences can quickly change. Mobile food vendors need all the advantages they can get to grow a sustainable mobile food business. Thankfully, mobile food businesses got a welcome reprieve with the recent sudden and sharp decline of oil prices! The effects of plummeting oil prices give many benefits to food truck entrepreneurs. The savings in diesel, propane, and gasoline expenses, are huge and will be felt every single time you fill up the fuel tank. Food trucks will have benefit even more compared to stationary restaurants. Cheap fuel also decrease in prices of supplies and ingredients that mobile vendors use, as overall shipping costs decline. But fuel savings also increase the purchasing power of mobile food customers. According to the EIA (Energy Information Administration), the average US household will spend $550 less on gasoline in 2015 if oil prices remain low. That’s half a grand that consumers have burning in their pockets that may show up at your food truck. At the moment, many believe that the price of oil will stay low for the coming months. The Organization of Petroleum Exporting Countries stated that their production will remain the same for the next six months as they watch how the market behaves. As the current rising supply exceed the present weak demand, and if OPEC do not cut back on production in the following months, 2015 will be a great year for food truck businesses. Mobile food vendors can leverage the low oil prices today to create lasting business opportunities With the savings gained from lower operating costs, food trucks can invest on their business by expanding the menu, replacing old equipment, or increase spending on marketing. Try new locations that are a further away but might yield higher sales. This is also a good time to invest in your business and not just pocket any extra income. When is the last time your food truck has spent some quality time with a mechanic? Finally, one of the best way to take advantage of this reprieve is building an emergency fund for your mobile food business. Predicting oil prices is always challenging. Hopefully the experts are right with their forecast of lower fuel prices staying well unto next year. Yet, despite the unpredictability of oil prices, there is something that food truck entrepreneurs really excel on and that is creating opportunities out of uncertain and challenging situations. Food on a Truck hopes lower fuel prices stay and continue to benefit mobile food vendors! We admittedly aren’t the first to use the hashtag #foodtruckfriday, but yesterday we had a blast promoting its use on the internet. We started with this tweet which was quickly retweeted and embraced by the food truck community. 1. It just rolls off the tongue and has great “stickiness”. People will remember it. 2. For new customers it’s a little reason for them to try grabbing lunch from a local food truck for the first time. Sometime people just need a slight nudge to try something new. 3. So many customers have their own social media following, it’s a great way for customers to share the food truck experience with a solid hashtag. 4. For many customers and especially 9-5ers, fridays are perfect to take a longer lunch than usual. It’s so close to the weekend, people are more apt to try something new. 5. The more the entire food truck community embraces this hashtag, the more the community can grow as a whole. Even though most people are just familiar with #throwbackthursday (#tbt for short), there are many more weekday themed hashtags. The important point is that the concept has been embraced by the internet for a long time…..well as far as internet standards, since 2011 or so. Because people are familiar with the weekday hashtag concept it will be easy for them to consume and embrace it. This survey by Mobile Cuisine shows Monday as being the most busy day for food trucks. We potentially could make friday the biggest day. But more importantly it will help spread awareness which will help food trucks beyond just fridays. Because as most of us already know, once a customer has fantastic food truck experience they will be back again and again regardless of what day it is! What do you think about #foodtruckfriday? If you are a food truck, what’s your busiest day of the week? Feel free to leave comments or catch us on twitter.